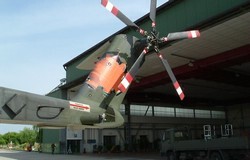 Claudio Toselli visited the 83° Centro CSAR at Rimini air base and kindly provided us with his report and photos of the specially marked HH-3F to celebrate the unit's 25 year annivesary of operations from Rimini AB. 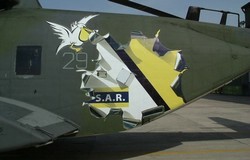 On May 27th, 2006, the 83° CENTRO CSAR (Combat Search and Rescue) of the Aeronautica Militare Italiana (AMI - Italian Air Force) 15° Stormo celebrated 25 years of operations from the Rimini air base. For the occassion these special markings were applied to HH-3F MM81341 '15-29', referring to the old paint scheme. 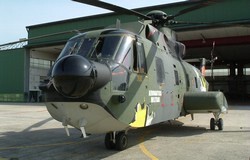 Many years ago before taking on the CSAR role, the "Pelicans" were painted in white and yellow. The history of 83° Centro CSAR goes back to 1925, when the unit was first established as 83° Gruppo of 27° Stormo. The maritime reconnaissance unit was then part of the Auxiliary Air Force (Aviazione Ausiliaria) for the Regia Marina (Italian Royal Navy) and subordinate of the Comando Aeronautica Sicilia (Sicilian Aviation Command). After the long and troubled events of the Second World War, the 83° was refounded in Brindisi equipped with CRDA (Cantieri Riuniti dell'Adriatico - Adriatic United Shipyards) CANTZ 501 and 506 seaplanes.From 1948 onwards the unit became part of the Comando Soccorso Aereo (Air Rescue Command) in Taranto and in 1959 its name was changed to Centro Coordinamento e Soccorso (Coordination and Rescue Centre). In 1958, the 83° arrived in Rimini taking on the Search and Rescue (SAR) role with the Sikorsky HH-3F Pellicano helicopter with two Squadriglie (Flights); 141^ and 147^. 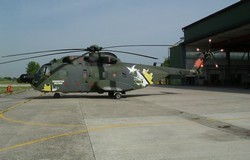 In 1995 the role changed to Combat Search and Rescue (CSAR) and the helicopters received the current camouflaged colour scheme. From 15 July 2003 onwards, the 83° Centro CSAR deployed to Iraq as part of the Italian Joint Task Force operation Antica Babilonia ("Ancient Babylon"), based at Tallil airport under command of the 6° Reparto Operativo Autonomo (ROA - Autonomous Operative Detachment).